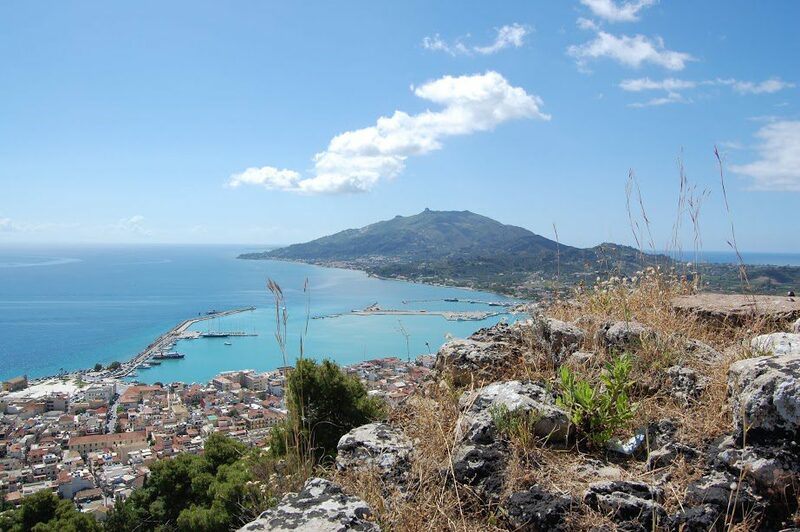 Set above Zakynthos Town in the region of Bochali, the ancient Venetian Castle is a wonderfully preserved park area, well worth a walk around. The castle is built on the top of a lush green hill with panoramic views of the island from all sides. During the years of Venetian occupation the castle of Bohali accommodated the capital of the island, the administration authorities and the military. It was here that the residents of the coastal areas fled to (especially the nobles) during wars or when the island was invaded by pirates. The English also chose to use it as their administration centre. The castle is built at the top of a lush green hill and according to archaeological evidence it is built on the ruins of the ancient citadel of the city (that of which was called ‘Psofida’). Large parts of the castle were demolished by the Turkish in 1940 and they then suffered further damage by earthquakes and invasions. In 1646 the walls were completed with help from the Venetians and their presence is apparent on the main outer gate where the wall bears the emblem of the famous Venetian ‘Lion of St.Mark’. Inside the castle the Venetians created beautiful buildings and a water supply/drainage system that was very modern for its time. Today the imposing walls are preserved in many places and the location is unique because you can enjoy a panoramic view of the island from all sides. While walking through the castle you can see the few buildings that are still intact, there is the stone vaulted prison, the large and small gunpowder rooms, the main bastion of the fort with a great view of Zakynthos town, the ruins of many churches from the 15th and 17th century and also the remains of the administration centre of the barracks from the period of British occupation.